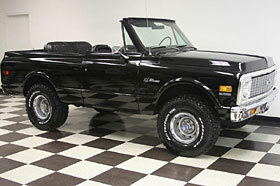 1972 CHEVROLET BLAZER, THIS AIN'T YOUR DADDY'S TIRED OLD BLAZER, THIS TRUCK HAULS. 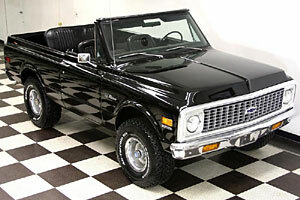 This BLACK ON BLACK 1972 Chevy K5 4X4 Blazer one of the meanest, cleanest, unmolested K5' Blazers we have ever had and it's the only one we have with a 4-SPEED. IT WILL TAKE $29,900 TO BUY IT.The Blazer has a built 355 Cubic Inch Small Block that is loaded with all the best parts.The block is a 4 bolt main with a steel crank, A.R.P. mainstuds, Melling High volume oil pump with hardened drive shaft, Milodon Diamond Stripper windage tray, LT1 pink rods and forged TRW flattop pistons. Custom ground Dual pattern Hydraulic flat tappet Comp.Cam.Comp. Cams Lifters.Comp. Cams Pushrods.Comp. Cams Guideplates.Comp. Cams Pro Magnum 1.6 ratio S.S. roller rockers.Pete Jackson Gear Drive that has been set up properly so it is very quiet, yet still noticable. Edelbrock, Polished Aluminum timing cover with roller thrust bearing. 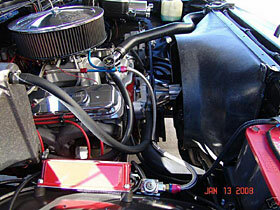 Edelbrock Victor Aluminum water pump with billet drive pulleys.A.T.I. super damper. Moroso 7 Quart Deep sump oil pan with swinging trap door.Corvette Aluminum Cyl. Heads 2.00 Intake 1.55 Exhaust (57 cc combustion chambers)Edelbrock RPM Air Gap intake. 670 CFM Vacuum Secondaries Holley Street Avenger Carb. with a billet 1\" carb spacer. Moroso polished Aluminum valve covers. MSD Pro Billet distributor (Vac. Advance)MSD Blaster coil.MSD 6A control box.MSD Pro Series wires.Be Cool Billet rad. overflow catch tank. Polished Vacuum Canister.The Motor easily puts out 400+ H.P . New Exhaust system with Flowmaster Delta Flow Mufflers and Stainless Steel turndown tips that sound awesome SM465 4 speed manual transmission NP 205 Transfer Case (Gear Driven) 12 Bolt rear diff. (3.73 Gears) Dana 44 front diff. (3.73 Gears) 32x11.50x15 BFG All Terrain Tires.